As the text moves away from describing the affairs of Yosef's family - now comfortably settled in Goshen with a land-grant from Pharaoh himself - it turns back to the main narrative thread of the famine and Yosef's official role as the Grand Vizier of Egypt. Notice the word order here, deliberately chosen by the narrator in the opening phrase for emphasis; a literal translation would read, "and-bread there-was-not in-all-the-land", rather than the more usual "and-there-was-not bread in-all-the-land". By bringing the subject to the front, it makes "bread" the focus of the clause; other things might still be available, but bread - the principle staple of every diet and here also used as a collective synonym for 'food' - there was not. As the song from the nineteen twenties ran: Yes, we have no bananas. The word , here translated "the land" is rendered "the world" by a number of translations to show the scope of the famine and the profile it had in the minds of those who were blighted by it; the famine was not localised to a particular area or region, it affected the whole world of the Egyptians, their own immediate land and their area of military or political influence. The rest of the verse demonstrates the limit of the Egyptian reach: "both the land of Egypt and the land of Canaan were wasted because of the famine". Radak speak of the "craziness" caused by hunger. Pharaoh's vision of the seven scrawny cows and seven blasted ears of wheat is being fulfilled to the last detail. Many times the Hebrew Scriptures speak of famine in a way that makes it clear that it is seen as a tool that G-d uses to chasten or rebuke His people: "There was a famine during the reign of David, year after year for three years. David inquired of the L-RD, and the L-RD replied, 'It is because of the bloodguilt of Saul and his house, for he put some Gibeonites to death'" (2 Samuel 21:1, JPS). Sometimes it happens a result or consequence of some action or event, while at others, it is the deliberate decree of Adonai: "Elisha had said to the woman whose son he revived, 'Leave immediately with your family and go sojourn somewhere else; for the L-RD has decreed a seven-year famine upon the land, and it has already begun'" (2 Kings 8:1, JPS). The prophets revealed times of famine as G-d's punishment upon the people for their sins: "When they fast, I will not listen to their outcry; and when they present burnt offering and meal offering, I will not accept them. I will exterminate them by war, famine, and disease" (Jeremiah 14:12, JPS). One particular instance of famine, announced by the prophet Amos to the northern kingdom of Israel, stands out from the rest. "A time is coming -- declares my L-rd G-D -- when I will send a famine upon the land: not a hunger for bread or a thirst for water, but for hearing the words of the L-RD. Men shall wander from sea to sea and from north to east to seek the word of the L-RD, but they shall not find it. In that day, the beautiful maidens and the young men shall faint with thirst -- those who swear by the guilt of Samaria, saying, "As your god lives, Dan," and "As the way to Beer-sheba lives" -- they shall fall to rise no more" (Amos 8:11-14, JPS). The people were well acquainted with the physical effects of drought and famine, of being hungry and thirsty; they knew only too well how that felt and what would happen to even the fit and able-bodied members of society, let alone to the weak and vulnerable. Amos used those vivid images to predict a famine for G-d's words, for there is to be a famine of the word of G-d throughout Israel. Moshe had taught the people that "man does not live by bread alone, but man lives by everything that proceeds out of the mouth of the L-rd" (D'varim 8:3, NASB) and the people were to see that principle worked out in their country. Israel had turned away from worshipping the G-d of Israel and successive kings had erected altars and images, idols and poles to the gods of the land and the gods of the surrounding nations who sought control over Israel. G-d responded by explaining that when His word is denied to the people there is no spiritual life in the nation and the land comes under the judgement of famine. Individuals may seek the word of the L-rd, but it will not be found in the land; people may travel from one end of the country to the other, looking for somewhere that the word of G-d is taught or spoken, but will not find it. Even the strong will waste away for lack of G-d's word and those who swore by the false gods and idols will entirely fall. Time and again, that effect has been worked out among the nations of the world, both in history and in our midst today. Wherever G-d's word is suppressed, there is a spiritual famine that eventually destroys the people and the countries involved. For decades, communist Russia sought to deny the existence of G-d and persecuted those few who tried to maintain faith and relationship with Him; yet the communist empire fell and although growing again today is still greatly weakened. Britain turned away from the word of G-d, both in specific commitments regarding Israel and in the downgrading and de-emphasising of Scripture and has lost its empire and place upon the world stage; successive governments continue to destroy the economy, trusting in the broken reed of Europe rather than in the word of G-d. America seems to be in the grip of the same process; gradually denying being "one nation under G-d" to become simply one of the nations, its military, social and economic policies becoming increasingly godless and self-destructive. Other nations follow suit as G-d is abandoned in favour of the new world order, as man comes into his own to rule the world in tolerance and equality. At a personal level, we see the peoples of the world echoing Amos's words. There is a huge demand for spirituality as man desperately searches for something to quench his spiritual thirst. Created for relationship with G-d, man knows full well that something is missing and is striking out in every direction to try and find something that will satisfy. The gnawing inside, growing doubt in the abilities of governments to realise his dreams for him, are driving man in ever more wild efforts to find the truth. He is looking everywhere but under his own nose. 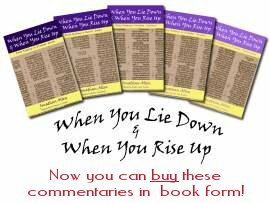 Discredited and despised, G-d's word lies unwanted on the floor, while the new age, kabalah, eastern religions and practices and other false hopes draw millions - of both people and money - flocking to their ranks. How do we respond to famine? By immersing ourselves in G-d and His word; by plumbing the depths of our relationship with Him to mine treasures to share with others and water to quench their thirst. Yeshua said, "I am the bread which is life! Whoever comes to me will never go hungry, and whoever trusts in me will never be thirsty" (John 6:35, CJB). He said, "Whoever puts his trust in me, as the Scripture says, rivers of living water will flow from his inmost being!" (John 7:38, CJB). As we take from what we have and share it with others - not in a preachy or judgemental way, but simply as one human being to another - our supply will not run out; as Elijah said to the widow: "The pot of meal will not get used up, nor will there fail to be oil in the jug, until the day ADONAI sends rain down on the land" (1 Kings 17:14, CJB). G-d is waiting for us to call Him on this; He has given us His promise, laid out His plans, shown us what to do and how to answer the desperate need all around us. He is waiting for us to start sharing His life in us with our families, friends, work colleagues, people at bus stops and in supermarket checkout queues, with anyone and everyone that He brings across our path. We are just like the twelve disciples that Yeshua sent out in the towns and villages in the Galilee; although most if us are not all in Israel, we need to hear Yeshua say, "Yes indeed; I tell you, you will not finish going through the towns of Isra'el before the Son of Man comes" (Matthew 10:23, CJB); we will not finish sharing Him with our neighbours before He comes. Application: If you feel a personal famine, then turn to G-d without delay and ask Him to satisfy your deepest desires in Messiah Yeshua. Then make sure that you start giving it away as fast as G-d pours it into your lap so that the supply won't be choked off.